'Tis the season to spike every festive beverage -- and egg nog is no exception. Today's recipe comes courtesy of my uncle Albert, who in turn got it from his friend Anthony. In fact, Anthony's original recipe is written so delightfully, that I'm going to present it, uncut, unedited (I do mean unedited, so don't judge), and ready for your consumption. Drink up! He passed away in 1976 but his eggnog recipe lives on. 2 Quarts of Whiskey. Any brand you want… I use the cheap stuff. 1 Quart of Rum. Again… the cheap stuff. 10 Quarts of cream: A combination of Heavy cream, Light cream and Half & Half. You can use the cream in any combination you want. I use 4- half & half, 3- light and 3- heavy. Separate the eggs and put about a third of the whites in the refrigerator to be used later. Discard the other two thirds of whites. Mix the yellows of the egg… mix and mix and mix… get the point? Add about half of the sugar then. Mix… mix… mix. Mix until the sugar is gone. Add two quarts of half & half and the remaining amount of sugar…. Mix again until there is no more visible sugar. Add the remaining amount of creams… mix… mix… mix. Add all of the liquors…. Mix … mix … mix. In a separate bowl fluff the egg whites then mix them into the eggnog. You can add any flavor you want, Vanilla, Almond.. etc.. I do not add any. You can also add nutmeg to each glass. This recipe was my Grandfathers he passed away in 1976. This recipe has been around a long time; no one has died from it… yet. This will make about 3 ½ to 4 gallons. Addendum: Hi all, me again. Here's the ingredient quantity breakdown if you want to make 1 gallon (though I think it comes out to more like 1.5). 1) Use a mixer. Makes it much easier and faster. 2) If you use a mixer, make sure it can hold up to a gallon or so of liquid. It got a little hairy for me at the end when I had no wiggle room left in the bowl and still a cup of rum and the egg whites to add. 3) I did not add any flavor either, though I did set out spices and liquor in case the guests want to augment. 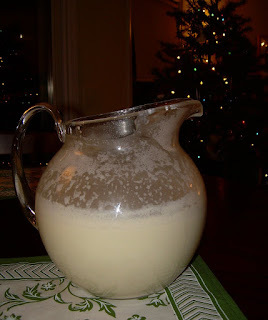 4) Remember: You can never have too much nog! !